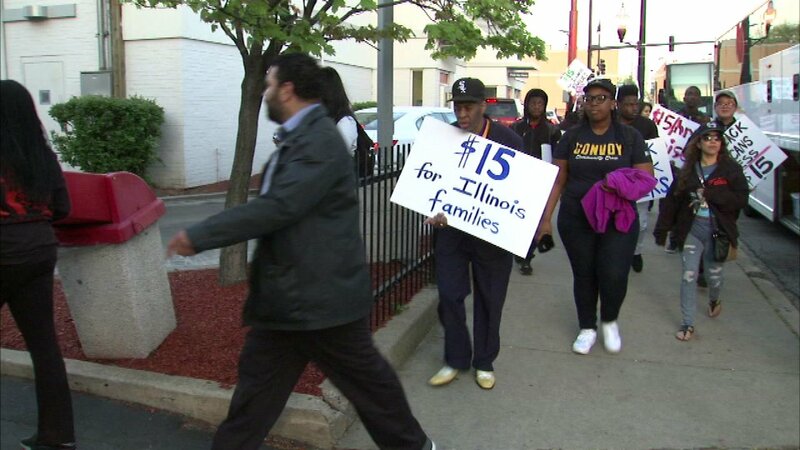 SPRINGFIELD, Ill. (WLS) -- Fast food workers in Chicago rallied outside of a McDonald's on Western Avenue before they took their fight for $15 an hour to Springfield early Wednesday morning. The Chicago-area workers headed to the capitol to rally in support of raising the minimum wage in Illinois to $15 an hour. The fast food workers were rallying to urge state lawmakers to pass HB 198. The bill would raise the Illinois minimum wage to $15 an hour by 2022. The bill was approved by the House Labor Committee earlier this month and now moves to the Illinois House of Representatives. The workers argue that a higher minimum wage would put money back in to the local economy and reduce the amount the state pays in public assistance. More than 40 percent of workers in Illinois make less than $15 an hour.